Babywise Gives the Gift of Sleep for Any Child. Babywise works for all types of babies. How Babywise can help your baby sleep no matter the disposition. I have six children. Five of those are mine by birth and all five of those I have had the privilege of parenting since birth have been raised with Babywise and the subsequent books (Pretoddlerwise, Toddlerwise, Preschoolwise, and Childwise). In fact, I am overdue to read Teenwise for my now-10 year old! I cannot say enough what a blessing this book has been to me and my kids! I find over and over again that when I follow the principles my children are happier, calmer, and just more fun to be around. Because, let’s face it, tired, cranky babies aren’t nearly so fun as well-rested ones! And obedient(ish) toddlers are far more enjoyable than disobedient ones. My youngest baby is now 7 months old. He was my latest to sleep through the night (defined as sleeping from at least a 10pm dreamfeed until 7am), but even so he was sleeping comfortably an 8+ hour stretch by 13 weeks old. Oh, and he has reflux. In fact, three of my Babywise babies have had reflux and all slept through the night by 3 months old. Greg – a Textbook Baby: Greg was born on his due date after exactly 12 hours of labor. He did everything exactly when the books said he would – good or bad! Thus, he, predictably, slept through the night at exactly 8 weeks old. No lead up! He nursed every 3 hours right up until one night he slept 8 hours. The next night he slept 9 hours, and so on until he was sleeping 8:3pm-7am every night. Aside from illness he never deviated from that. He was very much the type of kid who did great on routine, but would become fussy if off of his usual routine. However, I always knew we could handle a few fussy days during travel because within a few days of being home again and on schedule he was back to his normal cheerful self! Isaiah – a Spirited Baby: Isaiah came out screaming and pretty much kept on screaming for his first three months of life! He had severe reflux, colic, and several food intolerances. Poor kid was in discomfort most of the time! I was so blessed to be friends with Valerie during this time and part of a wonderful online babywise community and so was able to keep sane, navigate medications and elimination diets, and utilize the newborn sleep hierarchy principles to keep Isaiah moving towards the goal of a schedule and independent sleep even when at the start he was nowhere near there. By 12 weeks we had gotten the reflux under control with medication, I had eliminated the bothersome foods, and he began sleeping 11 hours every single night. He never did CIO for more than 2 minutes even because it would aggravate his reflux. 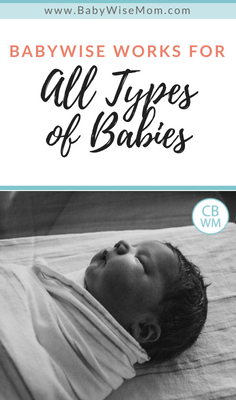 The Baby Whisperer’s 4 S Routine became a must-have and allowed us to follow Babywise principles even in a situation where we could not allow even a moderate amount of crying until he was older. Lia – an Angel Baby: Our thirdborn came into our lives in the most peaceful manner and was such a balm to my mother-spirit after the struggles with her older brother. Lia rarely cried, immediately slept without any props in her bassinet, and was just the sweetest, chubbiest little baby. She was on a Babywise schedule from the start, and because we’d had such success with the 4 S Routine, we utilized that with her as well, though she never needed the last step. She slept through the night at 6 weeks old! Rose – a Touchy Baby: We call Rose “Princess Pea” in our house, haha! She was so sensitive to the slightest discomfort! If even her socks fell off, she woke up cold and uncomfortable. In fact, I never would have imagined something as small as socks vs no socks could affect sleep except that Valerie had mentioned that one of her daughters seemed to prefer one over the other even as a newborn. Rose required all my sleep tricks: a solid routine, white noise, a good swaddle, the snuggleU, and the 4 S Routine….however with those she did sleep and pretty well! She never even had many issues with the 45-minute intruder. She also had reflux, but we were on top of the situation and hers was milder. She slept through the night by about 9 weeks old (for some reason I didn’t keep as good of records with her on sleep). Max – a Textbook Baby: And now, we seem to have come full circle! Max is the happiest little baby; he was born 2 weeks early but you would never know it by his size or activity level. Like his older brother, he is very happy when on his schedule, but if he is woken too early from a nap or anything he can get cranky and require extra cuddles to soothe him. He also has reflux which we have kept well-managed and we are currently trialing a prevacid-wean to see if he has outgrown it yet. We have a very busy household now of six kids (we adopted another in the middle there!) and I work part-time from home so Max has to cope with a lot more disruptions than my first couple of kids. However, like with Greg, I am more confident dealing with occasional disruptions because I know exactly how to get things back on track once things are over. 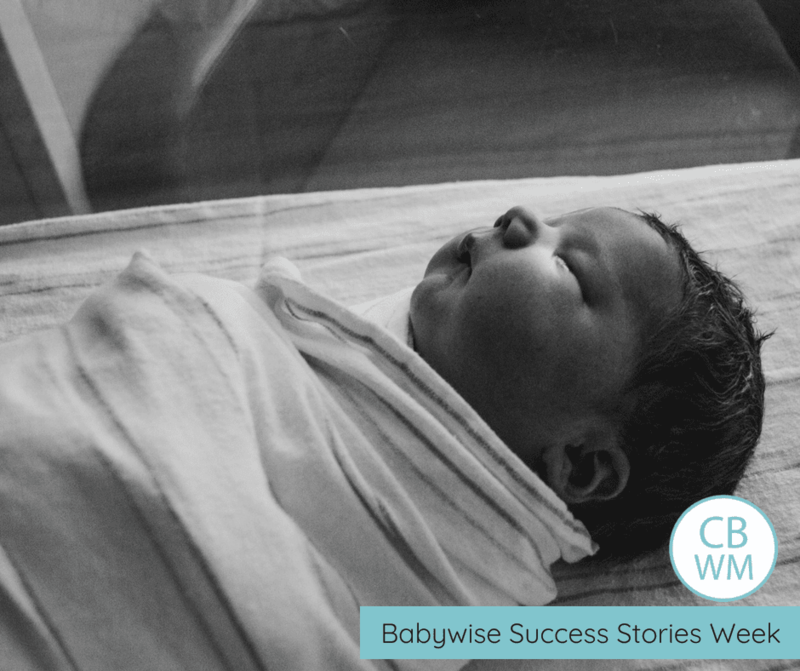 Babywise has given us not only a starting place for growing our family with a couple-centered approach, it has consistently (along with a few good friends and similar books) given me the tools to troubleshoot and manage difficulties thrown my way. Reflux, different temperaments, a larger family, moves, work schedules – none have kept our children from having the gift of sleep and a steady routine they can depend upon. We, and the schedule, adjust as life happens. I have a friend who says the specifics of what your family culture includes is not nearly so important as that you HAVE a family culture. Likewise, I think that the specific schedule you have (whether your baby has 4 feedings or 5 feedings a day at 6 months or whether bedtime is 7pm or 8pm) are not nearly so important as that you HAVE a schedule. As long as your children know that Mommy and Daddy love each other, have regular meals as a family at predictable times, and are getting adequate rest, they have a formidable foundation for life.